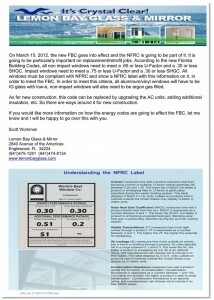 Lemon Bay Glass announces information on how the energy codes are going to effect the Florida Building Code (FBC). On March 15, 2012, the new FBC goes into effect and the NFRC is going to be a part of the new regulations. It is going to be particularly important on replacement/retrofit jobs. Link to Florida Building Code Update and read this full announcement. Contact Lemon Bay Glass + Mirror today for more information.